A 19-year-old pregnant woman at 19 weeks gestation was referred to the University of Iowa Hospitals and Clinics (UIHC) from an outside ophthalmologist for evaluation and treatment of suspected Acanthamoeba keratitis. The patient had been wearing daily disposable soft contact lenses for 3 weeks continuously followed by 1 week of removal at nighttime prior to her presentation. She began to notice left eye pain and decreased vision 1 week before presenting to an optometrist, who initially prescribed a combination antibiotic and steroid drop and subsequently a steroid-only drop. These therapies did not improve her symptoms. She was referred to an outside ophthalmologist who suspected Acanthamoeba keratitis and referred her to UIHC. At presentation to our clinic, she had severe left eye pain, redness, and photophobia. She had been using preservative-free artificial tears 2 or 3 times per day with no symptomatic relief. She denied swimming or using a hot tub in the previous 2 months, but had showered with contact lenses in place on multiple occasions. At the time of presentation, she had no established prenatal care. OS: Diffuse mild stromal edema with marked radial perineuritis; scattered anterior stromal opacities central to the perineuritis fronds; no epithelial defects but possible early epithelial degradation superiorly paracentrally; no keratic precipitates. Figure 1. 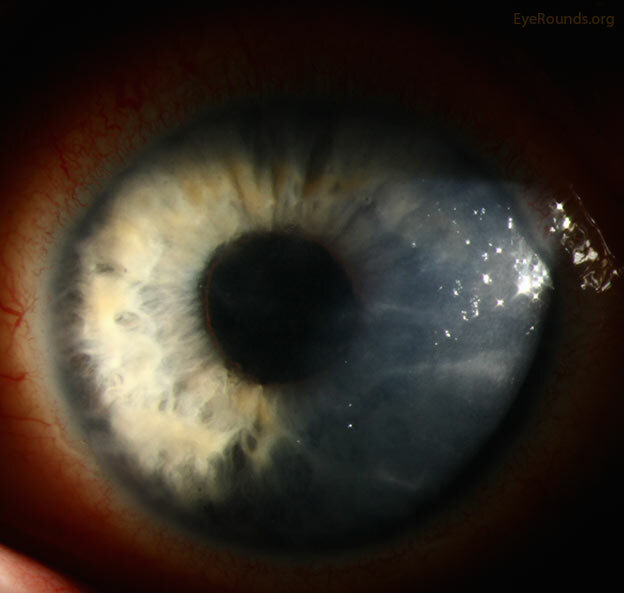 Slit-lamp photograph of the left eye demonstrating elevated areas of epithelial irregularity, superficial corneal stromal opacities, and marked radial perineuritis, a finding highly suggestive of Acanthamoeba keratitis. Left untreated, a single or double ring of stromal infiltrate may form (1). Corneal cultures OS: No organisms visible on Gram stain. Propionibacterium acnes growth in 1 of 1 vial; no fungal or aerobic growth. A history of continuous soft contact lens wear, discomfort out of proportion to the exam findings, and marked radial perineuritis suggested Acanthamoeba keratitis in this patient. A corneal epithelial scraping was obtained for culture and histopathologic exam along with tear samples for viral PCR testing, though neither was diagnostic. A bandage contact lens was placed for comfort, and erythromycin drops were started four times a day in the left eye for bacterial prophylaxis. Anti-acanthamoebic medication was not started in light of her current pregnancy and the concern for possible risk to the fetus. We assisted her in establishing care with an obstetrician urgently to assess the health of the fetus and to obtain recommendations regarding the risks of systemic absorption and placental transfer of topical anti-acanthamoebic ophthalmic medications. Three days later, the patient returned for a follow-up visit. She noted that the left eye pain was improved with the bandage contact lens in place but persisted along with her photophobia. In the interim period, she had an initial visit to an obstetrician who assured her that her fetus was in good health. He also advised that topical ocular anti-acanthamoebic medication was unlikely to cross the placenta in significant amounts and that the benefits of treatment outweighed the risks. Her vision in the left eye improved to 20/40 with correction and 20/25 with pinhole. The epithelial defect resulting from the diagnostic corneal scraping resolved. Our own literature search, in addition to consultation with the UIHC clinical pharmacists and the patient's obstetrician, led to the decision to recommend treatment with topical anti-acanthamoebic agents. The patient agreed to the plan after discussing the possible and uncertain risks to the fetus with treatment and risks to her eye without treatment. Punctal plugs were placed in the left upper and lower puncta to minimize systemic absorption of the ophthalmic medications. Polyhexamethylene biguanide (PHMB) and chlorhexidine drops were started in the left eye every hour while awake for 3 days, then every 2 hours while awake, and the bandage contact lens and erythromycin drops were discontinued. She returned to clinic one week later with improved vision and decreased ptosis, photophobia, and pain. Visual acuity in the left eye was 20/30 with correction and 20/20 with pinhole. Slit-lamp examination showed resolving radial perineuritis and decreased stromal haze. Given her improving status on these medications, no changes were made to her drops. Two weeks later she returned with greatly improved photophobia and reactive ptosis. At this time, her exam showed continued resolution of the radial perineuritis with scattered anterior stromal opacities, along with new deep stromal neovascularization of the cornea peripherally. In light of the neovascularization (felt likely related to a secondary inflammatory response) and her excellent response to anti-acanthamoebic medications, prednisolone drops were started three times per day. Her distance visual acuity at this time was 20/30 with correction and 20/20 with pinhole. After initiating the topical steroid therapy, the neovascularization receded. Over the next two months, the areas of acanthamoeba involvement slowly transitioned into stromal scarring and her acuity returned to 20/20. The anti-acanthamoebic medications and topical steroids were slowly tapered. Systemic absorption of topical ophthalmic medications is a well-established phenomenon and can contribute to unintended systemic effects. These effects are generally negligible in otherwise healthy patients, but must be considered carefully in select populations such as in pregnant women and children. There are a number of ways to minimize systemic absorption of topical medications, but these methods do not prevent it completely. Therefore, careful consideration must be taken to avoid unintended systemic effects. Small forniceal capacity and the rapid washout of medications by tears limit the absorption of topical ophthalmic medications. As a result, ocular medications are often extremely potent to achieve clinically significant concentrations in the eye. A standard eye drop has a volume of 50 μl while the conjunctival fornix is only able to accommodate 10 μl, leading to the immediate loss of 80% of the drop volume (2). Of the medication that remains, some is absorbed through the cornea and conjunctiva while the remainder flows through the canaliculi and nasolacrimal ducts, eventually reaching the nasal mucosa where the predominant absorption of ophthalmic medication occurs. Systemic absorption through the nasal mucosa is generally accepted to be an order of magnitude higher than ocular absorption, with some studies finding as high as 74% absorption (3 ,4). Medication absorbed from this surface reaches the bloodstream directly. In one study, timolol instilled in one eye was found to cause a statistically significant drop in intraocular pressure of the contralateral eye secondary to spread through the systemic circulation (5). Strategies to prolong ocular exposure to the medication can be utilized to minimize systemic absorption and maximize ocular absorption. These include manual nasolacrimal occlusion, use of punctal plugs, use of topical drops with higher viscosities, use of gels or ointments as opposed to drops, and the addition of vasoconstrictors (6). Limited data has been collected on the effects of medications used topically in the treatment of ocular disease during pregnancy. Though some of these medications may be contraindicated for systemic use, the low doses and nature of topical administration often lead to increased safety for ocular use. Table 1 shows the U.S. Food and Drug Administration (FDA) use-in-pregnancy categories and their definitions, which are often used as guides in selecting appropriate medications for use in pregnant women (7) . Table 2 shows the FDA categories for many commonly used ophthalmic medications (8). Most of these medications are in category C, indicating that there are no adequate and well-controlled studies in pregnant women. Table 1. FDA Use-in-pregnancy categories and definitions used in the United States. A Adequate, well-controlled studies in pregnant women have not shown an increased risk of fetal abnormalities. B Animal studies have revealed no evidence of harm to the fetus; however, there are no adequate and well-controlled studies in pregnant women OR animal studies have shown an adverse effect, but adequate and well-controlled studies in pregnant women have failed to demonstrate a risk to the fetus. C Animal studies have shown an adverse effect, and there are no adequate and well-controlled studies in pregnant women OR no animal studies have been conducted, and there are no adequate and well-controlled studies in pregnant women. D Studies, adequate well-controlled or observational, in pregnant women have demonstrated a risk to the fetus. However, the benefits of therapy may out-weigh the potential risk. Treatment should be monitored closely. X Studies, adequate well-controlled or observational, in animals or pregnant women have demonstrated positive evidence of fetal abnormalities. The use of the product is contraindicated in women who are or may become pregnant. Table 2. Commonly used ophthalmic medications and their pregnancy categories. Unless otherwise specified, topical ophthalmic formulations are listed (PO = oral; IV = intravenous; IM = intramuscular). *Please note: Systemic administration of *indicated drugs are categorized as a much higher risk in pregnancy. Further investigation and consideration on your part may be warranted when prescribing ophthalmic dosage forms (8). In this case, chlorhexidine and PHMB drops were used to treat the amoebic infection. A PubMed search for each of these medications returned no results regarding ocular therapeutic use in pregnant humans. However, chlorhexidine has been used for many years as an oral rinse to treat periodontal disease and multiple randomized controlled trials have demonstrated no increased risks to the fetus when used in pregnant women (15). Given the minimized absorption with punctal occlusion and lack of known adverse effects, we decided to proceed with treatment. A case report from Sweden describes a similar patient who was pregnant, in the first trimester, and presented with conjunctival injection, stromal keratitis, and a 1 mm hypopyon in the setting of soft contact lens wear. She was also treated unsuccessfully with antibiotics and steroids. Corneal biopsy and contact lens culture confirmed Acanthamoeba infection. Systemic treatment was not initiated in the patient reported by Skarkin et al due to her pregnancy, but propamidine isethionate (a diamidine also known as Brolene) and neomycin/polymyxin B treatment were used successfully. No adverse fetal outcomes were noted in the case report, but her pregnancy was not specifically addressed (16). As Brolene is not approved by the U.S. FDA at this time, it was not a treatment choice for our patient. Topical antibiotic selection must also be chosen carefully in pregnant patients due to potential effects on the developing fetus. Fluoroquinolones are used commonly to treat corneal ulcers and as postoperative infection prophylaxis. Though there are no prospective randomized clinical trials of these medications in pregnancy (hence classification as category C medications), a study with 200 pregnant women exposed to systemic fluoroquinolones during gestation and 200 matched control subjects demonstrated no changes in rate of spontaneous abortion, fetal distress, prematurity, birth weight, developmental milestones, or musculoskeletal dysfunction (17). Given their relative safety systemically, it is assumed that the risks of ophthalmic use are minimal and the benefits generally will outweigh them. Polymyxin B/trimethoprim eye drops (Polytrim) is also an FDA category C product. Trimethoprim is a dihydrofolate reductase inhibitor that limits cell proliferation, leading to neural tube defects in utero (18 ,19). Tetracyclines are category D drugs given the likelihood of causing bone and tooth abnormalities and discolorations (20). These medications, used commonly to treat blepharitis and meibomian gland dysfunction, generally should not be used in pregnancy and should not be used in patients who are breastfeeding. Erythromycin is a category B medication and is considered safe in pregnancy (12). Aminoglycosides (e.g., tobramycin and gentamicin) are known to cause ototoxicity when given systemically, and are therefore category D. Tobramycin eye drops are category B, however, due to the limited systemic absorption from ocular administration (11). Erythromycin (predominantly Gram positive coverage) and polymyxin B (Gram negative coverage) are considered the safest topical antibiotics in pregnancy (11). Acyclovir and valacyclovir, which are often prescribed orally to treat ocular herpes simplex virus infections, are category B medications. A historical cohort study performed in Denmark with 1,804 patients exposed to acyclovir, valacyclovir, or famciclovir in the first trimester demonstrated no increased risk of major birth defects (21). These medications have been relatively well studied in pregnancy and can be used if necessary with no reported adverse effects (11). Azoles (e.g., fluconazole, itraconazole, and ketoconazole) are antifungal medications often prescribed for oral use. These medications are category C, apart from fluconazole which was changed to category D in 2011 for all indications except a single dose at 150 mg to treat vaginal candidiasis. This change was made after several case reports were published in which women taking chronic high doses (400-800 mg) of fluconazole in the first trimester gave birth to children with distinct congenital anomalies (22). Chronic exposure to fluconazole in the first trimester is therefore contraindicated, and long-term antifungal medication should only be used cautiously. Glaucoma treatment can be a challenge in pregnant patients and children due to potential systemic effects from the medications. Beta blockers commonly used to treat glaucoma topically (e.g. timolol) are FDA category C in the first trimester, but increased caution is advised in the second and third trimesters as they can cause intrauterine growth restriction later in pregnancy and cardiac arrhythmias in the fetus (18). For these reasons, they should be avoided in pregnancy. They can also cause beta blockade in infants if used immediately prior to delivery and via breast milk, so therefore should be avoided in nursing mothers (23). Alpha agonists (e.g., brimonidine) are category B and generally felt to be a preferred medication for glaucoma treatment in pregnancy. However, they can cause somnolence, seizures, respiratory depression, and apnea in neonates and should be discontinued prior to delivery for this reason (24). Carbonic anhydrase inhibitors (e.g., dorzolamide and brinzolamide) are category C medications for oral and ophthalmic use as no well-controlled studies have been performed in humans to determine safety in pregnancy. Oral carbonic anhydrase inhibitors are contraindicated late in pregnancy as they can cause renal dysfunction and pH derangement in the fetus (18). One retrospective study looked at 50 pregnancies in which the mother was exposed to oral acetazolamide for treatment of intracranial hypertension prior to the 13th week of gestation, finding a similar risk of spontaneous abortion in the control group with no major complications (25). In rats, these medications have been shown to cause limb and kidney defects, though at higher doses than those used to treat glaucoma (25). These medications should be avoided in pregnancy (18). Prostaglandin analogs (e.g., latanoprost, travoprost, and bimatoprost) also have concerns with administration in pregnancy as prostaglandins are often used to terminate pregnancies and induce labor. Given these effects, many ophthalmologists are reluctant to use these medications during pregnancy. However, no studies have demonstrated systemic adverse effects on fetal health with these medications (18). Steroid eye drops (e.g., fluorometholone and prednisolone acetate) are category C medications due to a lack of well-controlled studies in pregnancy. Of note, intraocular pressure often falls during pregnancy (26 ,27), which may provide a protective effect against the pressure-raising effects of ocular steroids. Adverse effects from oral steroids (e.g., prednisone) have been described in humans including association with orofacial defects, conotruncal heart defects, and neural tube defects, but no studies in humans have demonstrated adverse effects from topical administration. In rats, ophthalmic steroid drops have been shown to have a teratogenic effect (18). Non-steroidal anti-inflammatory drugs (NSAIDs) also can be used to decrease inflammation, though these medications are category C due to lacking data. Systemic NSAIDs are contraindicated in pregnancy as they increase the rate of spontaneous abortions and fetal malformations early in pregnancy, and induce premature closure of the ductus arteriosus and oligohydramnios late in pregnancy (28). These effects have not been observed with ocular administration, but given the risks to fetal health, this category of medications should be avoided. Topical anesthetic and fluorescein drops, used commonly for diagnosis of external and ocular surface disease, have no known teratogenic effects and are generally considered safe in pregnancy (18). Dilated eye exams should generally be deferred until the postpartum period unless a chronic condition is being observed. All dilating medications currently available are category C and are considered safe to use in a limited fashion (27). Botox® (IM) is a category C medication, and no studies have been performed in pregnancy. A case report details its chronic use to treat a movement disorder in a patient who had four uncomplicated pregnancies while on this medication. This report also noted that the drug effect is local and limited to the area of toxin penetration, likely leading to minimal toxic or teratogenic effects to the fetus (29). To summarize, very little data have been collected regarding the use of ophthalmic medications in pregnant patients. Given this lack of data, it is difficult to make informed decisions on the best course of treatment for a given pregnant patient. Based on the information reviewed here, we recommended certain medications as initial treatments for ophthalmic conditions in pregnancy due to reported safety in topical administration (Table 3). Consultation with an obstetrician, the patient's clinical course, and sound judgement should also be used to guide further treatment. Table 3. Preferred ophthalmic medications during pregnancy (ophthalmic formulations unless otherwise specified). **NOTE: Brimonidine should be discontinued prior to delivery due to potential effects in neonates after birth. Sutphin JE. Chapter 55. Acanthamebiasis (Acanthamoeba keratitis). In: Roy FH, Fraunfelder FW, Fraunfelder FT, editors. Roy and Fraunfelder's Current Ocular Therapy. Sixth ed. Philadelphia: Elsevier Saunders; 2008; p. 99-102. Briggs GG. Drugs in pregnancy and lactation. Philadelphia: Wolters Kluwer/Lippincott Williams and Wilkins, 2015. National Library of Medicine. DailyMed: the official provider of FDA label information. [web site]. Bethesda, MD: NLM, 2015. [Accessed on Dec 22. 2015] https://dailymed.nlm.nih.gov/dailymed/. Schlect HP, Bruno C. Bacteria and Antibacterial Drugs. In: Porter RS, Kaplan JL, et al., editors. The Merck manual of Diagnosis and Therapy. 19th ed. Kenilworth, N.J.: Merck & Co, Inc; 2011; chapter 132 available at: http://www.merckmanuals.com/professional/infectious-diseases/bacteria-and-antibacterial-drugs/. USP. Proparacaine. USP DI, Volume II: Advice for the patient: Drug information in lay language. 27th ed. Greenwood Village, CO: Thomson Micromedex; 2015; chapter available at http://online.statref.com/.